With beleaguered north London football team Tottenham Hotspur set to play for the first time at its new £1 billion stadium this evening (3 April), taking on Crystal Palace in the Premier League, the club is surely hoping its fortune will change following a shocking run of recent losses. Perhaps the new stadium will give it the results it desires, yet one thing the Tottenham Hotspur Stadium will make use of is 5G, which is set to transform the fan experience. 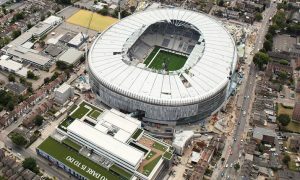 Spurs has invested millions into its new stadium – around £850 million, more than double the original cost expectation – and some of that has gone into improving the matchday experience for fans using new technologies. Live sport is a driver for emerging technologies like 5G and mixed reality, and the high tech Tottenham Hotspur Stadium puts the club in a good position to capitalise on those areas. Recent research from Amdocs, a provider of software and services to communications and media companies, suggests that 5G will transform the sports experience for fans in stadiums. Promising speeds up to tens of times faster and lower latency than 4G, 5G opens up the possibilities for new types of entertainment and in-stadium experiences. Audiences could, for example, watch instant replays and 360-degree streams, or look up player stats via augmented reality (AR) and virtual reality (VR) technology, bringing them much closer to the action. Altogether, 76% of network operators in Europe plan to use AR, supported by 5G, to offer richer viewing experiences to fans at sports stadiums. More than two thirds (65%) of European operators claim that upcoming major sports events, such as the 2020 European Championship, are influencing their 5G roll out timelines, so viewers may not have to wait long. Amdocs’ study also showed that nearly a third (29%) of European operators are planning commercial 5G launches in conjunction with top sports events; 82% of European operators are targeting the Euro 2020 football tournament (June to July 2020) to kick off 5G experiences to the consumer market. Altogether, 94% of European operators plan to trial 5G within sports and eSports venues by the end of 2020. Commented Gary Miles, CMO at Amdocs: “It’s essential for [mobile] operators to find successful use cases for 5G given the investment levels. Amdocs’ research has revealed that major live sports events could hold the key to consumer adoption of 5G. Operators have identified these events as the springboard for rollout of a whole range of new interactive and immersive services. This will give consumers their first real taste of what 5G can deliver and allow operators to showcase the capabilities of their next generation networks. “Expect to see the first of these new services and applications rolled out in conjunction with the 2020 soccer tournaments in Europe, among other big events in the sports calendar. We will also see operators becoming integral to the growth of esports with 5G opening the door to future investment and revenue opportunities,” concluded Miles.